With a Homeschool Graduation Theme! 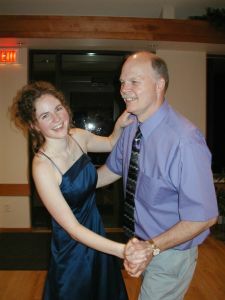 Laura (here with her dad) and her other graduating friends wanted to do something different to celebrate their last year of homeschooling high school. They wanted it to be a special dress-up occasion. So, they came up with the perfect idea, a Senior Homeschool Dance. 1. Ask for help. This is so important because you do not want to do this all by yourself, you’ll go crazy! So, find out if your friends would be willing to help. Chances are they will and they’ll have some great ideas. Once you get some volunteers it will be easy to delegate, because chances are they’ll be able to find something they want to do! 2. Pick a date. Because they wanted the prom to also be a graduation dance, they chose to have it in the spring. But don’t get too close to May as you will start to conflict with graduation parties. 3. Choose a location. This will all depend on the size of your group. If it’s small you could have it at your house. They chose a church. It had a room available with tables. You will want to keep the cost down, so keep that in mind when choosing your location. 4. Plan the menu. Here again, try to keep the cost down. The cheapest way would be for everyone to bring a dish to pass! 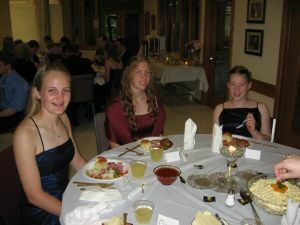 But the girls wanted it to be more of a formal affair and had food catered in. They found someone reasonable and the meal was tasty! Oh, and don’t forget to order (or have someone make) the cake! What about punch? 5. Create the invitation. Someone with computer skills and a little imagination will be able to put together a great invite. Be sure to include everything they’ll need to know, from what it is, to when (date and time), where (location), and what (to wear!) The girls wanted it fancy, so they suggested long formals and suits. 6. Go shopping! You’ll need to purchase a few things, decorations, place settings (if you’re going disposable), invitation paper, postage. Girls always want to wear something new to these events. Check out the resale shops, they have great deals on prom dresses. You will most likely find some great bargains after the school proms are over. Keep that in mind when choosing a date. Gee, I hope we’re not scaring you here. There will be a cost to throwing a party, any party. But you can keep it to a minimum. For instance, instead of mailing the invitations, hand them out at meetings, church, etc. 7. Plan the music. 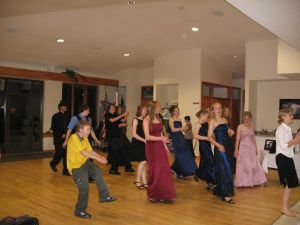 Whoever heard of a homeschool prom without a dance? The girls had taken ballroom dance lessons, so they were very excited to be able to put their lessons to good use! 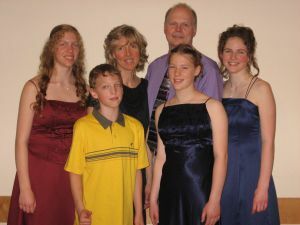 Laura was able to find some good songs from some of her and her friend’s CDs and they made their own recording to play at the dance. She took our stereo from home and it worked out just fine. It saved on having to hire a DJ! 8. Make a display board. The girls made a display board of photos that they gathered of all the seniors beforehand and titled it “Homeschool Memories”. We had a table set up for the seniors to display their senior portrait also, if they wished. The guests liked looking at the photos and reminiscing. 9. Plan the evening’s agenda. Even if you keep your party simple you should have some sequence of events so that the evening runs smoothly and is a success. Typically, it starts with the meal, followed with someone thanking everyone for coming. 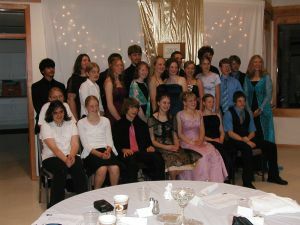 The Senior Homeschool Prom also made time for Homeschool Graduation. Some of the parents said a few words about their graduating senior and then gave their child a diploma. Make time for pictures after serving the cake. Then kick off the heels, it’s time to tango! 10. Have Fun! If you’ve planned well (with some help) it should all go smoothly so that you, too, can have some fun!